Final Fantasy. The name itself has so much meaning for gamers. It has grown into an icon of the industry, and has inspired people to discuss its significance and create fan-works. Some people hate Final Fantasy games, though more people probably love them. Regardless of personal feelings for the franchise, there are certain Final Fantasy games that have more significance than others. One of those in particular is Final Fantasy VII, and whatever fervent opinions it might draw out, it is difficult to dispute its status in video gaming history. I have played almost all Final Fantasy games. Some of them only for a short time, and several new iterations not at all. Even so, having once been an ardent RPG'er I must reluctantly admit that I have unto this day not finished a single Final Fantasy game, save for my introduction to them on the Game Boy (Final Fantasy Adventure). Several of them I managed to get quite far into, only to inexplicably stop playing shortly before the end. But my biggest regret was never having finished Final Fantasy VII. I think what made me loose my motivation with that game was the powerful events surrounding Aeris' demise. With the FFVII franchise being revitalized by Advent Children and a couple of games set in that universe, I began to think about the game again. Then, a few months ago I saw Last Order, an animated short that revealed information to me I didn't know up to that point. It got me thinking more about the game, and at last I made the decision to start playing it. Knowing my tendency to loose interest in games when they start to drag out, I resolved to persevere with FFVII and finish it for the first time. My intentions here are much more than a simple rekindling of interest in the franchise as a result of Square's marketing efforts. It might have been sparked by that, sure, but the fact that the game is so iconic is what makes me want to examine it from a different perspective. 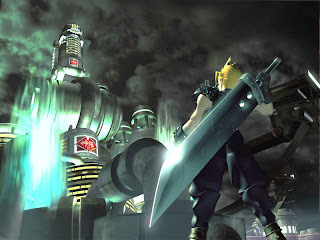 The initial success of Final Fantasy VII can be attributed not only to its fan-base, but in large part due to the sheer novelty of the game itself. At the time of its release, the technology was some of the best we had seen. Graphically, FFVII made a leap forward with beautiful CG cutscenes, and real-time 3D battle animations that were very impressive. The graphical polish of all Final Fantasy games has been influenced by the style introduced in FFVII, with subsequent games always delivering some of the best visual art possible on the home console. These factors, combined with Square's marketing push for the game, made Final Fantasy VII one of the most popular role-playing games of all time. 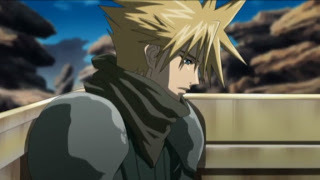 Consequently, it was many people's first introduction to role-playing console games, which only contributed to cementing FFVII's place in history. I know I was certainly impressed by it at the time. This is why I felt it even more important to play the game again now. I have had years of time to distance myself from the novelty factor of the game, have gained a lot of perspective as a result. Setting out to play it this time, I was certainly not going to be blown away by its graphical achievements. Nor was I going to be impressed by FFVII because it's the first RPG I am playing. With those superficial elements aside, I could focus on its deeper significance. That is assuming, of course, that there was any such deeper significance to be found. Going into this experience I was hoping to focus on plot, character development, and whatever greater meaning I might glean from the message presented by Final Fantasy VII. In short, I wanted to get at the real meat of the game that would have probably escaped me all those years ago.